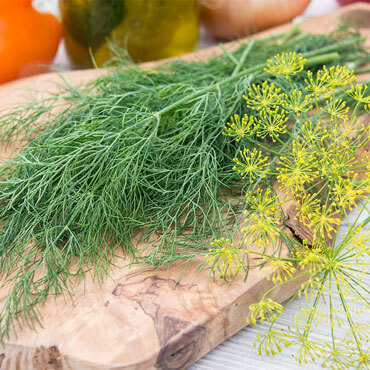 Dill's pungent seeds are a must for your pickling brine. Super Dukat's feathery leaves perk up fish, seafood, dips, veggie salads, and sauces of all kinds. Use dried, fresh or frozen. Slower to bolt than standard dill, meaning they won't produce premature flowering stems that take nutrients away from the herb itself. Pollinators love the mature, delicate flower, so be sure to let a few bloom to attract bees and butterflies. If you've never planted dill before, try using our 12" x 12" seed mats! The Super Dukat seeds are encased in biodegradable paper that protects the seeds during germination and dissolves in the course of watering. Simply place seed mat in the garden or in one of our Grow Tub® containers and water as usual. No worries about over- or under-seeding! Annual. 60 days to maturity. Soil Preference: Well-drained fertile soils.